Comandante Luis Piedrabuena: general data - Cmte. Luis Piedrabuena, Patagonia, Argentina. 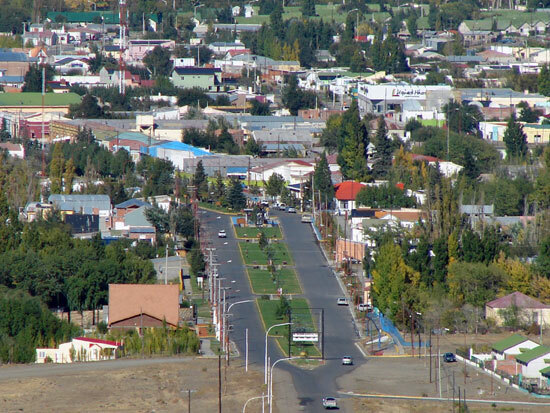 The people of Santa Cruz say that Comandante Luis Piedrabuena is an oasis in Patagonia. An oasis that has 5000 inhabitants and stands on the great estuary formed by the rivers Santa Cruz and Chico at the foot of a large plateau. Santa Cruz River is a paradise for fishermen. Is that this is the only place in Argentina where "steelhead" trout specimen are fished, which can weigh up to nine kilos. This species lives in rivers in Alaska, the United States and Russia, but are smaller. Steelhead trout have a particularity: fattening at sea, spawn in the Santa Cruz River and then travel about 380 kilometers into the lake Argentino, near the town of El Calafate. To preserve the species is allowed only fly fishing with 'spinning', which is a modality that uses a single hook spoon. Comandante Luis Piedra was founded on December 1, 1878, but the first inhabitants settled on the island Pavon nearby. Located 154 kilometers north of Río Gallegos, on National Route 3. Santa Cruz River, of 500 meters wide, is ideal for water skiing, sailing and kayaking. A good walk is to visit the house where the Comandante Luis Piedra lived, who is now a museum, and to eat the Patagonian lamb made to stick. The island has a lodge, cottages and plots with a stove to install tents and mobile homes. It also has a modern hatchery dedicated to raising "rainbow" trouts. Pavón Island Resort Pavón Island is located 3 km from the town of Comandante Luis Piedra, between the main bridge and the secondary bridge over Santa Cruz river. The Resort offers visitors the chance to spend a pleasant, quiet and at peace stay with friends or family. International Steelhead Trout Festival The International Steelhead Trout Festival takes place in late March or early April in Luis Piedrabuena, because this town is considered the "National Capital of Steelhead Trout", for being one of the places in the country where you can find this variety of "heads of steel" trouts in greater numbers and size. Children's Theme Park Comandate Piedrabuena has a new recreational space for the young ones with the theme of cartoon characters as Patoruzú and Isidoro Cañonez. Botanical and Recreational Garden Park San Carlos The city of Piedrabuena has the only botanical garden in the province of Santa Cruz and it is the southernmost in the world. There you can live a unique and magical experience learning about nature and its historical context. Swans arrive to Piedrabuena The sighting of black-necked and coscoroba swans is one of the attractions of the town of Piedrabuena in the month of November because you can see whole families wandering the shores of river.